Reversing entries are optional accounting procedures which may sometimes prove useful in simplifying record keeping. A reversing entry is a journal entry to “undo” an adjusting entry. Consider the following alternative sets of entries. The first example does not utilize reversing entries. An adjusting entry was made to record $2,000 of accrued salaries at the end of 20X3. 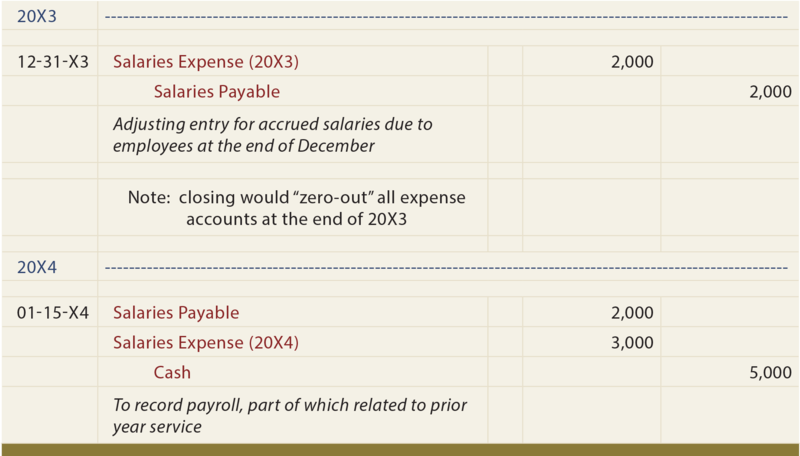 The next payday occurred on January 15, 20X4, when $5,000 was paid to employees. 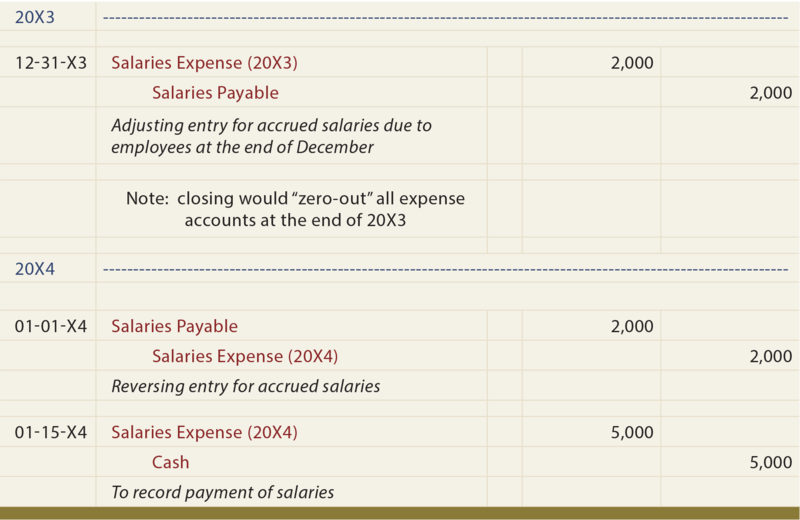 The entry on that date required a debit to Salaries Payable (for the $2,000 accrued at the end of 20X3) and Salaries Expense (for $3,000 earned by employees during 20X4). The next example revisits the same facts using reversing entries. The adjusting entry in 20X3 to record $2,000 of accrued salaries is the same. However, the first journal entry of 20X4 simply reverses the adjusting entry. On the following payday, January 15, 20X5, the entire payment of $5,000 is recorded as expense. BY COMPARING THE ACCOUNTS AND AMOUNTS, NOTICE THAT THE SAME END RESULT IS PRODUCED! In practice, reversing entries will simplify the accounting process. 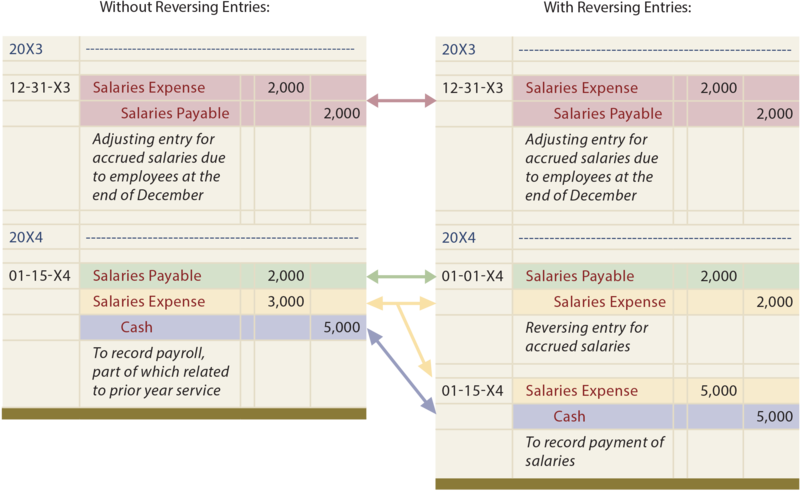 For example, on the first payday following the reversing entry, a “normal” journal entry can be made to record the full amount of salaries paid as expense. This eliminates the need to give special consideration to the impact of any prior adjusting entry. Reversing entries would ordinarily be appropriate for those adjusting entries that involve the recording of accrued revenues and expenses; specifically, those that involve future cash flows. Importantly, whether reversing entries are used or not, the same result is achieved! When and why might reversing entries be used? Demonstrate, by example, the use of reversing entries, versus no reversing entries.